At Florida Steel Building Systems we strive for excellence. We are a multi-faceted company offering design build and value engineering for all your metal building needs. Florida Steel Building Systems is equipped to handle any construction project from conception to completion. We deal with some of the finest names in the steel industry. 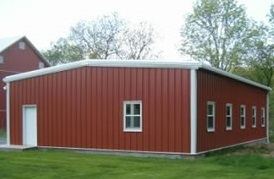 Our diverse line-up includes metal building systems, metal building components and metal building repairs. We provide comprehensive building solutions with services ranging from design calculations to building erection. In a rapidly changing economy, builders and architects are looking at a wide variety of options to get the most for their dollar. Pre-engineered metal buildings offer a cost-effective, sustainable, long-term solution to many building challenges. The greatest benefit of pre-engineered steel buildings are the custom structures that come to life as designed per exact specifications. Factors of the site, other buildings in the area, proposed purpose, and surrounding elements may be taken into consideration. Pre-Engineered Metal buildings are extremely versatile and traditionally have been used in the commercial and industrial market segments as warehouses, distribution centers and industrial facilities. They’re making inroads into other markets, however, such as churches, schools, shopping centers, office buildings and other commercial and mixed-use facilities.